Why Show the Teaching staff how to use the library? I can’t stress enough how important I think it is to ensure that teachers get to do a library orientation with you. It’s way more than just showing them what resources we have. It’s about setting the library atmosphere you want for the whole school year. It doesn’t matter if it’s your first year at a school, or you’ve been at a school for years. Ask to be scheduled into the orientation schedule. How can you start planning this? What is the main target or goal that you have for this school year? It could be a couple of goals, but I decided to really focus in on one. How you want to contribute to the school community. This year I decided that teaching plagiarism is the main goal that I really wanted to accomplish this year. I want to help my colleagues to consistently teach what plagiarism means across grade levels, across subjects and across languages. Our school offers courses in Korean, English, Spanish and Chinese. I want to help all of our teachers to be on the same page with what different types of plagiarism are no matter what they are teaching. How did I get started on creating my presentation? This is just the way I organized my thoughts, of course there are many ways to approach this. Plans are always a great start, but I did end up switching a few things around. Being negative right from the get go can give a bad impression. I didn't want to be negative at all in the presentation so I kept the library rules to 1 slide. I do want teachers to know what the library rules are because there will be many times that library staff won't be there to supervise and they will be (we're a boarding school with after school and weekend hours). I only included one pet peeve of mine, which is when a class leaves without pushing in any of their chairs. I added the library hours onto the same slide as rules, that'll be obvious once the school year starts. I recommend adding in points to your orientation, which have come up already during the orientation or that are a part of your school's culture. During our school's orientation we were lucky enough to have Jonathan Borden, author of Confucius Meets Piaget: An Educational Perspective on Ethnic Korean Children and Their Parents visit (see book cover below). We also had the amazing Beth Puma present us with many effective strategies for helping our language learner students. I tied in points from both of their presentations into my own. I wanted to include some kind of activity that would keep the energy up, and keep everyone's attention. I hate attending boring presentations were people just speak the whole time, so I thought that this would help to make it more memorable and fun. From a recommendation from a fellow librarian, I chose to use the SLA's Credit Where It's Due by John Royce. There is a plagiarism activity which asks you to read scenarios and figure out where to draw the line between scenarios which are not plagiarism and scenarios which are. I asked the teachers to chat in groups of 2-4 about what they thought and we all compared answers afterwards. It's shocking how many different lines are drawn! This is the result every time I have run this. This is an absolutely fantastic resource that I highly recommend adding to your professional development collection. 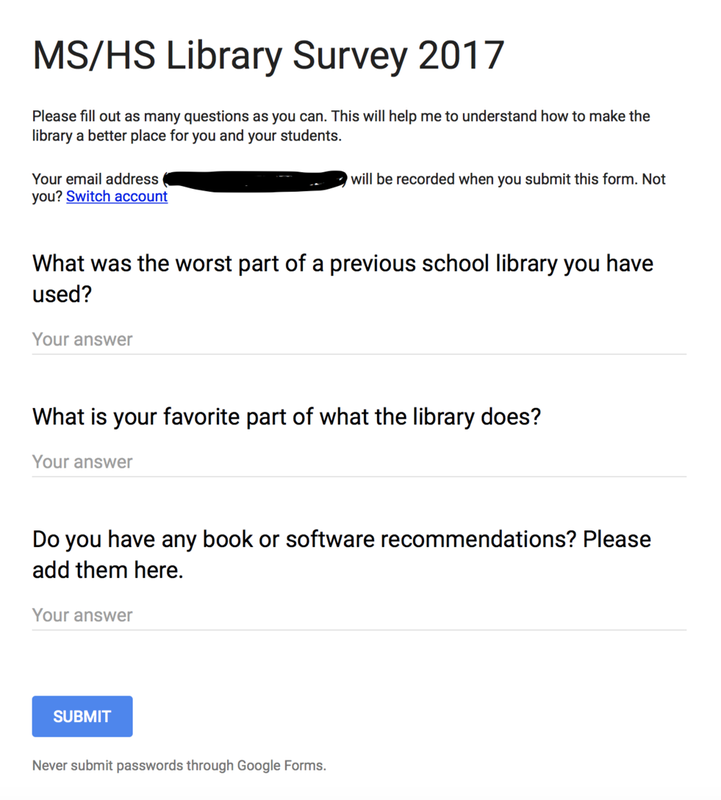 I created a quick survey of the most important three points I could think of to help me understand a bit more about what our teachers want from the library. I was amazed at how responsive staff were. I received ideas from almost every staff member, with lots of book recommendations and software links. I set the Google Form to record who submitted the answers so that I could chat with them afterwards in person. I always follow up with a summary email of all the key information that I've presented. This is often just a simple bullet point list, and links to resources. I try to make this pretty comprehensive with the library hours, staff names, etc. so that teachers can use this as a reference email if they want to look something up later. Just a note: I know that this blog may seem way too late for the beginning of the year. However, this is the beginning of the school year for me. This year I am taking on a new adventure at as a founding librarian at a school that has an intentional late start, so hopefully you can use some ideas from this post next year.